The Amy Brown Collection at the Anonymous Mint proved so popular with collectors and fans of Brown’s work that the mint is back with a special limited-edition design. Just in time for Halloween and the fall season, the mint unveils a haunted pumpkin patch design sure to catch the eye of any fan of Brown’s work. The 5 oz Antique Silver Amy Brown Collection Haunted Pumpkin Patch Round is currently available to you for purchase online at Silver.com. Ships to you housed inside of protective capsules with an included Certificate of Authenticity! Limited-issue round just for Halloween! The obverse face includes the image of a haunted pumpkin patch. On the reverse is the image of Dusk. Designs by Amy Brown and rounds developed by Julie Lindquist. Serial numbers engraved on the edge. The latest release of an Amy Brown design from the Anonymous Mint comes with the same popular options collectors found in the Amy Brown Collection. This new Haunted Pumpkin Patch release for Halloween comes with 1 oz silver rounds and 5 oz silver rounds. Each of the two weights comes with three options which include proof, antique, and colorized proof options. For the new Halloween release, the Anonymous Mint has set limited mintage figures. This means these rounds are sure to sell out quickly. Each of the 5 oz rounds has a set cap of 500 rounds per option. The 1 oz rounds have a 3,000-round cap on the proof, with 2,000-round caps on the antique and colorized choices. 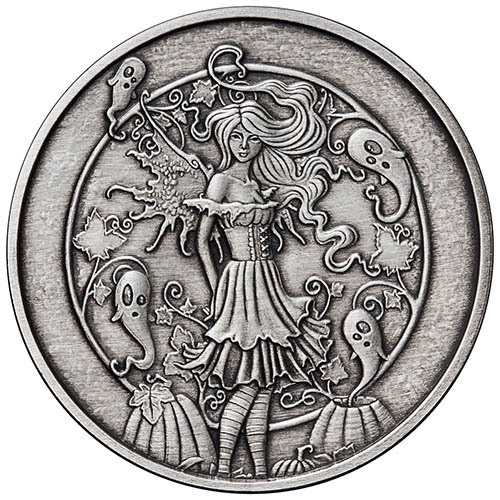 On the obverse of 5 oz Antique Silver Amy Brown Collection Haunted Pumpkin Patch Rounds is the image of a fairy standing amidst a pumpkin patch. The fairy stands with pumpkins visible at her feet and four ghosts fluttering around her, including two at the top of the design field eerily playing with her hair. The background depicts the image of a moon with the vines and leaves of a pumpkin surrounding it. 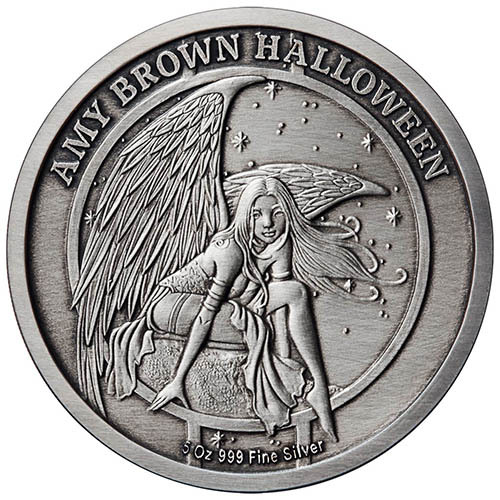 The reverse side of 5 oz Amy Brown Collection Haunted Pumpkin Patch Rounds feature the image of Dusk. This is one of Brown’s oldest fairy designs and it depicts a fairy responsible for watching over the realm as day recedes into the night. Dusk is depicted on a high, rocky perch with a dreamy gaze as she looks out over the realm below. These 5 oz Antique Silver Amy Brown Collection Haunted Pumpkin Patch Rounds come with a protective capsule and a Certificate of Authenticity with matching serial number. The antique rounds have a matte appearance and visual elements similar to that of ancient coinage. We encourage Silver.com customers to call us with questions about silver for sale at 888-989-7223. You can also connect with us online through our live chat and email address features.